WHY DO I FEEL STAGNATION IN MY WAY? Gratitude to the higher frequencies of light and love, as well as to the channellers. My question, or rather, a request for guidance, is that I know and feel the spiritual evolutions in recent years, but on the earth plane I feel a stagnation, and this is where I ask for guidance, because I know I can contribute a lot, but it does not seem I find a way. I ask for guidance, because this situation has distressed me a little. Gratitude! Daughter, the only purpose of every human being is to purify himself, to transmute his restraints, and to leave the ego, leaving the mental process for the I AM energy to be coupled with all wisdom, love and radiance. When you allow the energy of the I Am to engage in your being, in your process of personal evolution, you become more and more, a crystalline channel of light, of love and compassion. And so it is detached from everything that restricts you in material life. The greatest purpose of help, daughter, is to help yourself, when you then have the confidence to manifest your gifts through the perfect anchoring of the I Am in your radiance field. The purpose, daughter, is not the material charity, but the expansion and connection to everything. From the anchoring and deep understanding of the feeling of unity, where then, charity will become a natural purpose of your being. Be in that certainty and anchor the peace of that unique purpose. Dear Masters, the Universe provided for us two, who are like soul sisters, to meet us. Since then we have discovered common thoughts and goals. Among them there is a strange connection with two other people, who are two brothers, who helped us to evolve as souls. Is there any future possibility between us and these brothers? Is there any reason for this connection that we believe has a specific purpose? Or would it be an illusion of our minds? In an earlier reply, the Masters said that one of us terminated the contract with one of these men, but why is there still the connection? In addition, we feel a very special connection with a city from another country. Is there anything we will live there? We would like to know what has behind this interest and desire to be there. Thank you so much! Daughters, greetings. 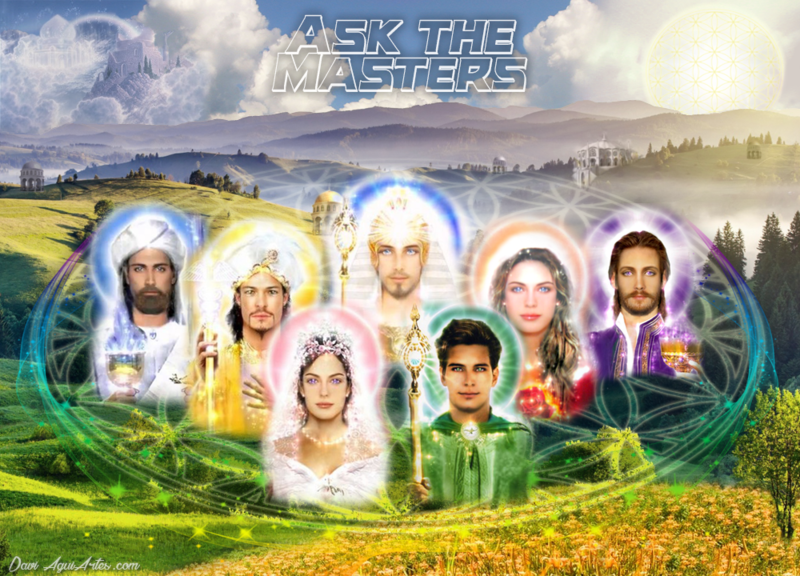 I'm your brother, Serapis Bey. The answer they need is just one. We are all connected in terms of soul, for everything. There is no connection that is more special than others, whether of people or places. All this is part of aspects related to the human personality that we create to supply our own inner needs. There is nothing, daughters, that is not made for a greater purpose of gathering experiences and evolution. It is not simple for them to understand this, they look at life from the environment of earthly life, where they believe they need to bond to something or someone. It seems a little cold the view I give you at that moment, but no, my dear. It is liberating. For it shows the reality that the true and only connection that they have is their essence with the truth I Am. All else are mental illusions that build to support the planetary life while you still not anchoring with all intensity the truth I Am, when it remains linked to the planetary reality. This connection they feel for people who share common energies, which become like tastes and a kind of love, is an energetic attraction provided by the earth environment. A vibrational attraction that can finish with the evolution of either. Unconditional love is one that has no expectations, where nothing is expected, nothing is charged, that has no bonds, but only radiates the freedom to be and nothing else. Everything else is mere delusion we create to make the days smoother. But life, daughters, is built day by day, and just as today you share and share that common interest, tomorrow maybe this energy affinity diminishes, and each one will follow his path of life. But do not create expectations for anyone in life, the attachment is the root of all suffering in this world. Only unconditional permission is liberating. Be in peace. Hello beloved Masters. My question is regarding to Ascension. Some esoteric Gnostic currents say that the only form of ascension is sexual magic, where Kundalini energy is awakened, and solar astral bodies are built. Also emphasized is the need to kill the ego. What could you say about that? Thank you! Peace, love and light. My beloved brother. The ascension occurs when the feeling of unity becomes so prevalent in you, that the being is able to feel in unity, to be the oneness and thus to flash its radiance in perfection to all that is. Ascension does not depend on external factors, but it is a state of perfection. Perfection in the sense of trust that anchors in the heart, be so prevalent in you that nothing will shake your confidence in the process. It is a state which one understands the real role of matter, detaching itself from everything, from attachments, from wants, transmuting everything that binds you to this three-dimensional game. It is simply a state of unity. There is no formula, no single path. There is only the call of God, and nothing more, God's time for the call to become so strong that nothing is able to get out of the way. And this path is individual, it can take place through a long process of lives and lives, or steeply in a great trauma that frees you of everything. Each being already has its path traced by the creation itself. Everything else is illusion of the mind, they are vain attempts to get something that is already yours. Be in peace. Good morning, masters. It is a lot of joy always, to be here in this beautiful connection, gratitude. I feel that I have much to give and to teach, I feel that it is my great joy, but I do not find this way. What do I do to get this frequency in my way and I can understand? Once again I love being here, and feeling your presence, gratitude! Daughter be at peace. The day you understand that the great differential you have, it is simply your joy, your presence, which manifests itself in a great energy that takes the environments that is inserted. On that day you will understand how much you already help everyone. You do not need to do anything extraordinary in your life, just live lightly, softly and compassionate in your gaze, stay away from judgments and remain in a state of gratitude for everything. Furthermore, be at peace and continue on the path, free from all expectations about what you want to become or what you will be. Allow yourself to be in the now, and let the rest come to you naturally, in your time, within the lessons you need to learn. And so, be at peace. Very, very often when looking at the clock, I observe sequences of numbers of the type: 15:15 - 23:23 - 13:13 and, recently, also sequences of type 12:21 - 23:32. I would like to know which message you want to pass me. Daughter, the universe is always giving you signals, not just through numbers, but of objects that appear in front of you, whether it's a coin, a pen, a book that bumps into a bookcase, or a glass that breaks in your house. All this is your angels, your protection team trying to say hello, look at us, see us here, reality is greater than you see. We are together with you, we love you. You are loved. The message is simple. You are protected and loved, trust us. Dear Masters. I always have answers and advice to friends who come to me, but I am uncertain and uncertain about my marriage. I feel that my husband and I have different goals and ideas on how to live. I do not know how to act or think to live in harmony. Gratitude for this space and opportunity. Save daughter, why do you need someone who has the same interests as you? Seek the root of this, because you may be in need of something, or someone to assert you, and show you what you are, and not oppose you. The greatest truth of life, daughter, is found in respect for diversity. In keeping the truth regardless of any external situation. And maybe that's where your husband can help you, because he will not help you keep your truth. It will have to be sought in your heart. Very simple would be if there was someone who would assert you in everything. But the great difficulty is to keep our truth, with respect and admiration for those who have their own, yet different from ours. You can keep your truth alone, or with someone who does not share the same goals and ideas. This is indifferent, daughter. But it does not justify changing a life, only by different ideas or goals. Truth should not be interfered with from the outside, because it alone is. Be in peace.